The moment she discovers the existence of Richard, a long-lost relative, at Israel’s Holocaust Museum, Margaret McMullan begins an unexpected journey of revelation and connectivity as she tirelessly researches the history of her ancestors, the Engel de Jánosis. Propelled by a Fulbright cultural exchange that sends her to teach at a Hungarian University, Margaret, her husband and teenage son all eagerly travel to Pécs, the land of her mother’s Jewish lineage. After reaching Pécs, a Hungarian town both small and primarily Christian, Margaret realizes right then and there how difficult her mission is going to be. A recipient of a 2010 NEA Fellowship in literature, a 2010 Fulbright at the University of Pécs in Pécs, Hungary, and the National Author Winner of the 2011 Eugene and Marilyn Glick Indiana Authors Award, Margaret McMullan is the author of seven award-winning novels. In 2015, she and Phillip Lopate curated Every Father’s Daughter, an anthology of essays about fathers by great women writers such as Alice Munro, Ann Hood, and Jane Smiley. She was the Melvin Peterson Endowed Chair in Literature and Creative Writing at the University of Evansville, where she taught for 25 years. Recently she served as a faculty mentor at the Stony Brook Southampton Low-res MFA Program. She writes full time now in Pass Christian, Mississippi. Margaret McMullan has written a beautiful and heartrending account of her pilgrimage to Pecs, Hungary in the hope of retrieving what she can of the story of a distant (Jewish) relative, lost in the Holocaust. 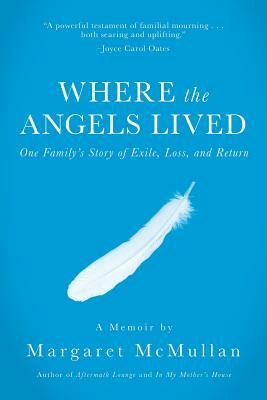 Written with her usual vividly realized, emotionally engaging prose, in which Margaret emerges as a protagonist with whom the reader identifies, Where the Angels Lived is a powerful testament of familial mourning as well as a vision of 20th century European history that is both searing and uplifting.